Kinetic River Corp. has been granted a Small Business Innovation Research (SBIR) grant from the National Institutes of Health (NIH). The 6-month Phase I grant was issued to Kinetic River by the National Institute of General Medical Sciences (NIGMS), an NIH institute fostering extramural research focused on development of innovative biomedical diagnostic and therapeutic platforms. The SBIR grant is partially funding the development of Kinetic River’s “Arno” cell-analysis technology. This approach is aimed at expanding the multiplexing capabilities of flow cytometry while reducing the compensation issues connected with spectral overlap of fluorescent dyes and streamlining instrument footprint and complexity. Kinetic River self-funded early-stage tests for proof of concept and is now accelerating the Arno development timeline with the resources made available through this grant. The Arno technology, unlike mass cytometry and other techniques, can be incorporated in both cell analyzers and cell sorters, and is completely compatible with accepted workflows. Two product versions are planned; one offering compensation-free operation on up to 10 channels for most common assays, and another with 30+ channels aimed at immunophenotyping. Kinetic River secured its fourth patent on October 3rd. U.S. Patent No. 9,778,193 addresses unmet needs in analysis of cells, tissue, and materials by introducing a novel, label-free optical interrogation technique. Kinetic River now has three separate patent families established. 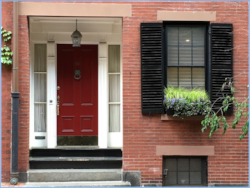 The major focus of its intellectual property portfolio is flow cytometry and cell sorting, with additional applications in imaging cytometry, material analysis, and other fields. 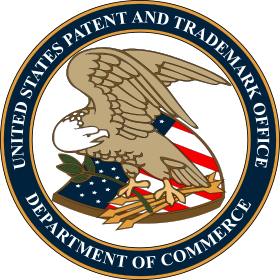 Innovations introduced in these patents include expanded fluorescence multiplexing, high-throughput sorting for rare events, and label-free analysis with ultrafast laser pulses. This recent issuance brings Dr. Vacca’s total to 28 U.S. patents granted. Two feature articles penned by Dr. Giacomo Vacca appeared in Laser Focus World earlier this year. 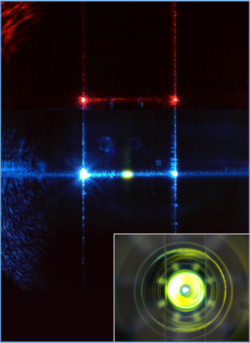 The first article, published in the May issue of Laser Focus World, describes a new set of software tools available for efficient optical system design. 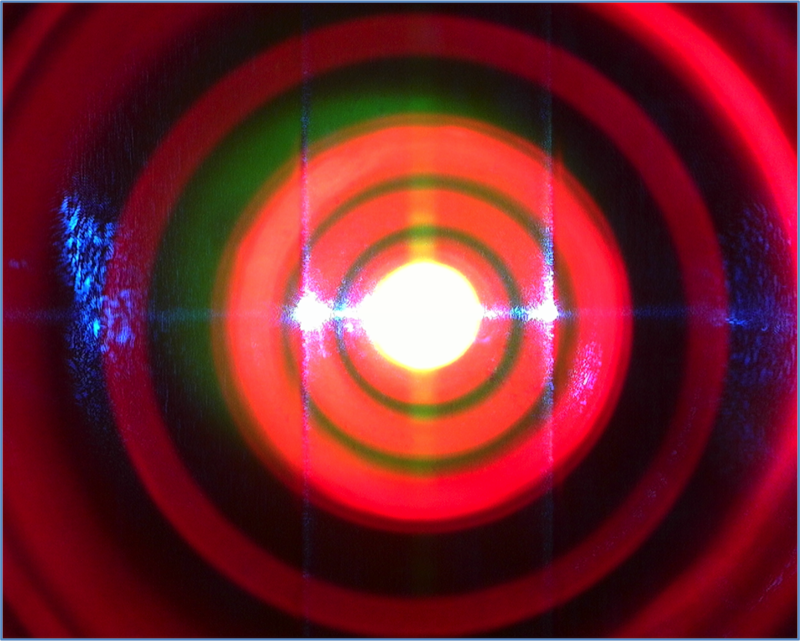 Written together with Dr. Vacca’s colleagues at BeamWise, Inc., it addresses current problems in translating optical designs into working prototypes, simplifying design and engineering workflows, and reducing rework and waste. The second article was published in the Laser Focus World June issue. In it, Dr. Vacca looks at trends in flow cytometry, and the constant push toward more demanding and powerful applications. Some of the technology advances highlighted include microfluidic chip sorters, nanoparticle detection, and highly multiparametric analysis. Dr. Vacca will be presenting at the monthly meeting of the Consultants’ Network, an affiliate group of the IEEE society. The talk will take place on Dec. 12 at SEMI in Milpitas, Calif., and will review many of the approaches taken in the life sciences to perform simultaneous measurements on biological samples. 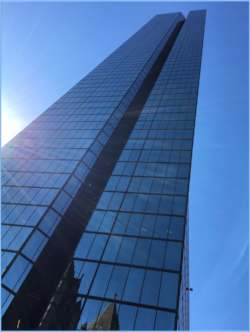 Kinetic River had a strong showing at CYTO 2017, June 10–14 at the Hynes Convention Center in Boston, Mass. 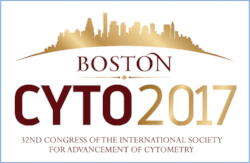 CYTO, also known as the 32nd Congress of the International Society for Advancement of Cytometry, is the premier event for showcasing science and innovation in cellular analysis. Dr. Vacca was a member of the CYTO Program Committee again this year, reviewing paper submissions for the conference. Kinetic River participated in the CYTO Innovation networking program, discussing with attendees the latest developments of its Arno multiplexing technology. Four members of the Kinetic River team were on hand this year. The company showcased its latest developments in booth 514 at the exhibition and in private discussions with many clients. Dr. Bill Telford, of the National Cancer Institute, presented a paper coauthored by Dr. Vacca and other collaborators. Dr. Telford shared details of Kinetic River’s Potomac modular flow cytometer recently installed at NCI, as well as his plans for how to make the most of the flexibility afforded by that system. Dr. Vacca, with coauthors Kshitija Shevgaonkar, Nga Hawk, Veena Kapoor, and Bill Telford, presented a poster describing the development of the Potomac analyzer, including design choices and selection of components. 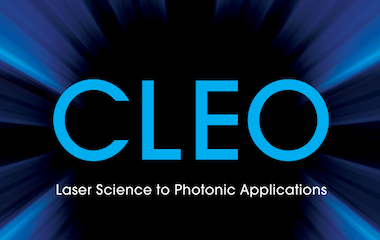 Dr. Vacca was asked once again to moderate the Technology Transfer program at CLEO, the annual conference on laser science and photonic applications held May 13 – 18 in San Jose, Calif. The program included keynote talks and presentations by speakers from National Laboratories and university offices of technology licensing. Participants also witnessed a pitch session where entrepreneurs or intrapreneurs presented their photonics-based product ideas to a panel of judges. The Optical Society’s Industry Development Associates, OIDA, asked Dr. Vacca to participate in a VIP Industry Leaders Speed Meeting Lunch for current students and young professionals. Six groups of 7-8 attendees asked Dr. Vacca and other experts questions on careers for graduates in optics and photonics in a timed series of 10-minute exchanges. Dr. Vacca also participated in the OIDA Networking Dinner. 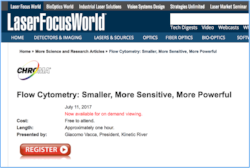 On July 11, Dr. Vacca was featured as the speaker on a webinar hosted by Laser Focus World: “Flow Cytometry: Smaller, More Sensitive, More Powerful.” In the webcast, Dr. Vacca looked at what applications are driving the field, and how technology innovators are responding to the challenge. 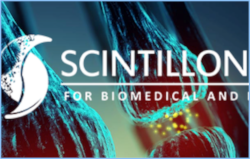 Kinetic River is a continuing sponsor of the Cytometry Development Workshop, organized by The Scintillon Institute and held in San Diego and La Jolla, Calif., October 25 – 29. The conference includes three events: Tutorials on Oct. 25; the Symposium on Oct. 26; and the Workshop on Oct. 26 – 29. Dr. Vacca is giving two talks at the Workshop, and Kinetic River is exhibiting at all three events. Two more interns joined us this summer. Avni, from University of California – Berkeley, and Dario, from Archbishop Mitty High School in San Jose, were a great help with marketing, R&D, and prototyping. We wish both of them well as they continue their studies.